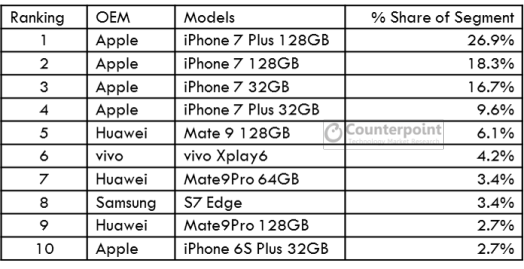 Latest data from Counterpoint Research for the first quarter of this year has come in, and the trends don’t look encouraging for both Apple and Samsung. 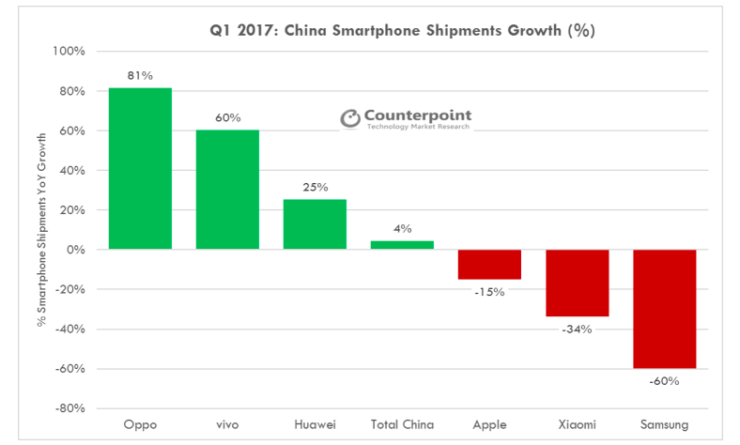 Apple’s iPhone shipments witnessed a steep fall of 15% year-on-year in China in the first quarter, resulting in a drop from 12.3% in Q1 2016 to 10.1% Q1 2017 for the Cupertino giant. Facing the worst of the fall is Samsung, whose shipments shrank by 60% year-on-year in China in the Q1 2017. Samsung witnessed a drop from 8.6% in Q1 2016 to 3.3% Q1 2017. One of the primary reasons behind the decline of the giants is the rise of homegrown brands in China. The local brands are giving stiff competition to both Apple and Samsung. Brands like Oppo, Vivo, and Huawei witnessed a surge in their market share in China. In the report, Counterpoint states that Oppo’s shipments grew by 81%, Vivo’s shipments soar by 60%, and Huawei by 25%. Surprisingly, “Apple of China” – Xiaomi saw a fall of 34% in its shipments. Chinese smartphone market as a whole expanded by 4%, registering the fastest growth for mid-range devices that generally fall below Apple’s product catalog. The mid-tier $100-$199 and $300-399 segments were fastest-growing segments, mainly driven by Huawei, Oppo and vivo with strong offline plays. However, Apple has not been able to grow at the same pace in this segment which has capped its total-addressable-market to the 4000 RMB or $600+ wholesale segment. This is one of the key reasons that has put the brakes on Apple’s growth in China. In the super-premium tier, Apple still rules the chart with its latest devices grabbing 80% share. The company hold top five slots when it comes to premium devices costing 4000 RMB and above. On the other hand, Samsung only holds one slot in the premium segment with its Galaxy S7 edge, but even that comes after Huawei’s Mate 8 128GB and Vivo’s XPlay 6. On the whole, top-selling smartphones sales share (costing 4000 RMB or more) in China in Q1 2017 is ruled by Apple and Huawei with five and three devices on the list, respectively. Well, this report by Counterpoint shows that Samsung and Apple need to pull up their socks in China to stay in the game.